The following is a guest post from Camille Salas of the Library of Congress. On June 11th, I had the opportunity to conduct a Viewshare presentation at the Library of Congress. In addition to a demonstration of how Viewshare works, I shared a few examples of how staff members at the Library of Congress are using the platform. One of the views I highlighted was created by Julie Miller, a historian in our Manuscripts Division. Julie first heard about Viewshare in December and contacted me to help her set up a view. She ended up creating a truly unique view about maritime documents originating from the eighteenth and nineteenth centuries. Her view has the potential to reach many different audiences interested in a wide range of subject matters. The following is an interview with Julie about the collection and her experience with using Viewshare. Camille: During our first meeting, I really enjoyed the opportunity to see some of the documents you wanted to showcase through Viewshare. Please tell us about the collection. Julie: As American ships traveled through foreign ports in the late eighteenth and early nineteenth centuries their captains had to negotiate a thicket of laws governing empire, trade, peace and war and disease. The result was that every ship accumulated piles of documents: clearances, bills of health, receipts of payments of customs and lighthouse duties, bills of lading, ship passports and more. The Manuscript Division has hundreds of these documents. Now that more than two hundred years have passed since most of them have fulfilled their original function, they have acquired layers of historical meaning. Stories about war and empire, diplomacy, slavery, epidemics, revolutions, privateers and pirates, and the careers of ship captains and colonial officials can be read in these documents. Camille: What prompted you to think about this collection as a possible fit for using Viewshare? Julie: The Manuscript Division has a goldmine of these documents in its Miscellaneous Manuscripts Collection, which consists of tiny collections of historical manuscripts, most of them small enough to fit in a single folder. Because they are arranged alphabetically, the ship papers, which consist of one folder per ship, each folder containing one to five documents, are scattered through the three hundred boxes of the Miscellaneous Manuscripts. I had been looking for a way to identify the ship papers with some kind of guide, so when I saw your Viewshare demonstration at the Women’s History meeting, Camille, I thought, Aha! that’s the way to bring this physically separated group of like items digitally together. And I thought Viewshare would make the information in the documents visible and quantifiable. There was also something else – as I looked at more and more of these ship papers, I began to suspect that they were not especially miscellaneous. While their dates ranged across a century, from approximately the 1780s to the 1880s, and while many American and foreign ports were represented, most of the papers appeared to be clustered in a short time period, from about 1800 to 1812. Furthermore, many appeared to document trade between Baltimore and the Caribbean islands, mostly in the slave-grown crops of sugar, coffee, and cocoa. 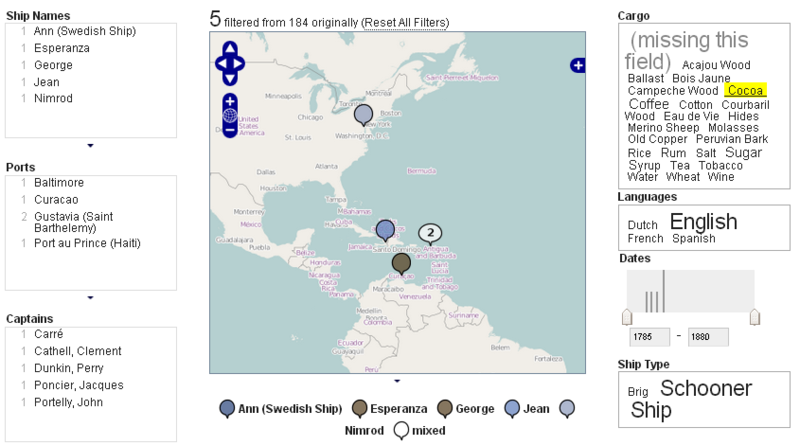 To see whether many of the ship papers actually constituted a coherent collection of documents about Baltimore and the West Indian trade in the early nineteenth century, I chose a sample, made an Excel spreadsheet, and uploaded it to Viewshare. My sample consisted of a single accession: a group of approximately 127 documents representing about eighty-eight ships that the library bought from a rare book dealer in 1903 for $33. When I built a map and created tag clouds and lists, the dominance of Baltimore became obvious, as did its trade with Caribbean ports, especially the French colony of Saint Domingue, today, Haiti. Viewshare made it possible to see that these documents were not miscellaneous at all, but instead constitute a rich and meaningful collection. Camille: Please walk us through the process of organizing the content and data for your view. For example, what kinds of decisions did you make with respect to the data you wanted to include? Julie: My sample presented many challenges. The first was deciding what data to include. To ensure comparability, I ultimately decided on information that was common to most of these documents: ship name and type, ports, dates, captain, cargoes, and languages. While many are in English, the many foreign languages — Spanish, French, Portuguese, Dutch, Swedish, German and even Latin — were also challenging. 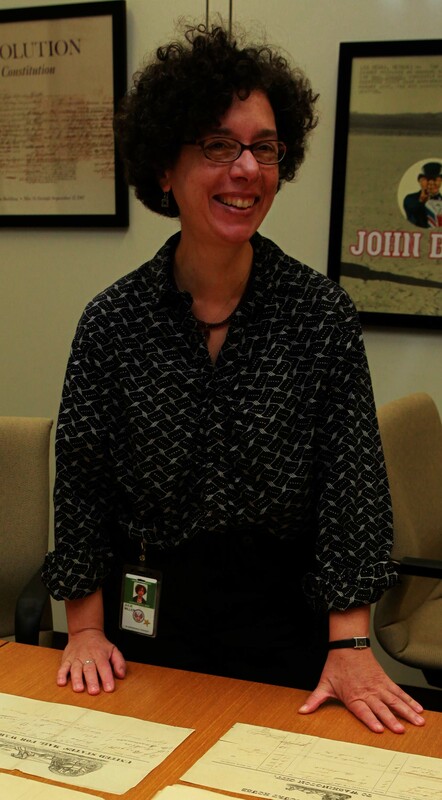 I was lucky to have help from Library of Congress staff members and interns with specialized language skills. 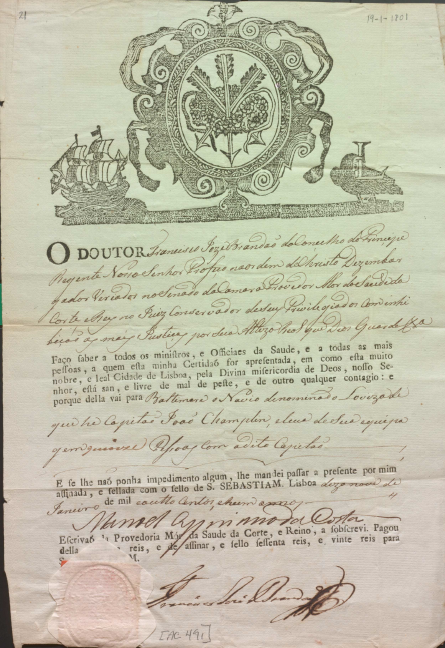 Taru Spiegel of the European Division, for example, translated an 1809 Swedish customs declaration of the brig Cyrus, which passed through theport ofGustavia in the Swedish Caribbean colony of Saint Barthelemy carrying sugar, coffee, anti-malarial “Peruvian bark,” and “old copper.” (When the King and Queen of Sweden came to the Library in April we showed them this customs declaration among other items documenting the long history of trade and friendship between Sweden and the United States.) 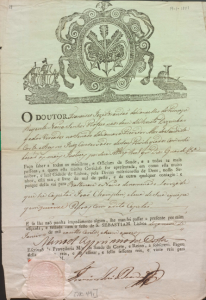 This summer, Manuscript Division intern Crosby Enright translated a group of Spanish documents. My French, meanwhile, has come in handy. Changes in place names have also proved challenging. During the French Revolution, for example,Franceand its colonial possessions jettisoned old royalist place names and replaced them with revolutionary ones. OnceFranceemerged from its revolution many of the old place names were restored. The Haitian city known today as Port au Prince, for example, was known as Port Republicain during the revolutionary years. 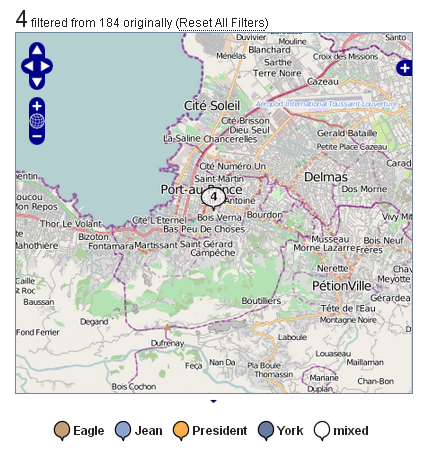 While Viewshare recognizes and can assign map coordinates to Port au Prince, it does not recognize Port Republicain. The answer was to find the modern name for each old name. To preserve the old names I created a separate field for them. While I designated the old names as text fields, I designated the modern ones as location fields so that Viewshare could find the map coordinates for them. I am currently investigating ways to move beyond my sample to enter all of the ship papers into Viewshare, and eventually to add images to the database. Camille: While creating your view, did you learn anything new about the documents or about how you wanted to represent them online? Julie: The main thing I discovered, and that I hope to convey to researchers, is that these documents, which look deceptively mundane and were created for strictly bureaucratic reasons, are in fact rich with fascinating and detailed information. Some of this information is apparent in individual documents, while some only becomes visible when the documents are viewed as a group. Camille: What audiences would most benefit from the view and how do you envision them using it? Julie: Historians will appreciate the way that Viewshare makes it possible to manipulate data in these documents. The trade in sugar, coffee, and cocoa documented in the ship papers opens many avenues for research for historians of slavery, the economy, consumption, and more. Epidemiologists might be interested in the way that governments attempted to control contagious disease by making ships present bills of health. Conservators at the Library have already expressed interest in the dye woods and other pigments that some of these ships carried. Genealogists will find the list of ship captains’ names useful. The beautiful engravings on many of the documents should be of interest to art historians and might also contain useful information about the ships, port cities, and lighthouses they depict. Teachers should find the Viewshare table an unexpected way to help students understand history. I hope that Baltimore teachers will see the ship papers as a way to understand the history of their city. Caribbean teachers should find that the ship papers provide material for the study of their colonial past. Finally, I hope the fragmentary but evocative information the ship papers contain about past people, places, and events will spark the imaginations of creators of novels, children’s books, artworks, films, websites, and more. This is a syndicated post. Read the original at The Signal: Digital Preservation 2013-07-31.